The water treatment plant operates 24/7 using two 12 hour shifts. A 13-member operations team ensures the wells, treatment plant, distribution system and storage reservoirs are running properly at all times. The team also maintains a strict maintenance schedule, and makes needed repairs when equipment needs to be fixed or replaced. 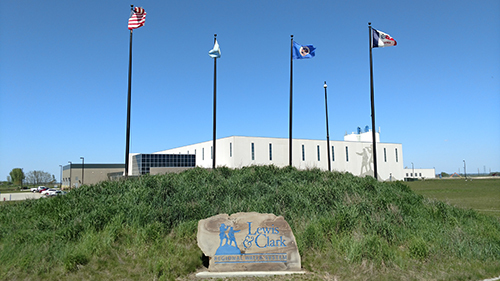 Water from Lewis & Clark won the Best Tasting Water contest at the SD Association of Rural Water Systems’ Annual Technical Conference in Pierre in 2016 and 2017. This is a testament to the dedicated and hard working operations team. The System’s current water loss is only 0.9%, which is virtually unheard of in the industry. A water loss of 5% would be considered very good. This is a testament to the outstanding engineering team, operations staff and pipeline installation contractors. Hardness of the treated water is only 9 grains per gallon (160 parts per million).